Total sales were down 3.9%. Based on 2012 numbers the trend suggested that 2013 revenues should have registered a 2% growth, so that is a -6% swing in momentum. Digital grew by 4.3% which was not enough to offset the impact of declining CD sales, which has been the story every year since 2000 except last. Download sales declined by 1%. Continued competition from apps and other entertainment, coupled with subscriptions poaching the most valuable download buyers is finally taking its toll. Subscriptions up by 51%: An impressively strong year for subscriptions but not enough to make the digital increase bigger than the physical decline on a global basis nor in key markets, including the US. Global numbers of course can be misleading and there is a richly diverse mix of country level stories underneath them, ranging from streaming driven prosperity in the Nordics, through market stagnation in the US to crisis in Japan – where revenues collapsed by 16.8%. The Nordic renaissance helped push Europe into growth but data from the RIAA, show that total US music revenues were down a fraction – 0.3%. US download sales were down by 0.9% while subscriptions were up an impressive 57% to $628 million. On the one hand this shows that Spotify has managed to kick the US subscription market into gear following half a decade or so of stagnation. But on the other it shows that subscriptions take revenue from the most valuable download buyers. This backs up the trend I previously noted, that streaming takes hold best in markets where downloads never really got started. Thus markets like the US with robust download sectors will feel growth slowdown as high spending downloaders transition to streaming, while in markets like Sweden where there was no meaningful download sector to speak of, subscriptions can drive green field digital revenue growth. Though subscriptions now account for 27% of digital revenue, the value trend obscures the consumer behavior trend. 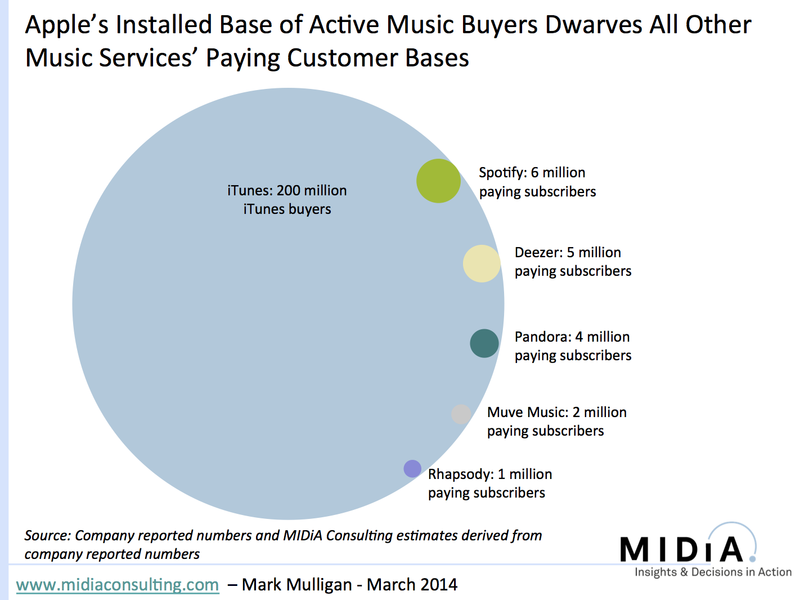 For Spotify’s c.9.5 million paying subscribers (or 6 million last officially reported) Apple’s installed base of iTunes music buyers stands at c.200 million (see figure). The IFPI report that there are now 28 million subscription customers globally. In the US and UK this translates into 4 or 5% of consumers. Subscriptions do a fantastic job of monetizing the uber fans, just like deluxe vinyl boxsets and fan funding sites like Pledge do so also. But they are inherently niche in reach. This is why downloads remain the music industry’s most important digital tool. Downloads are the most natural consumer entry point into digital music, and if anyone else had been able to come close to matching Apple’s peerless ability to seamlessly integrate downloads into the device experience, then the sector would be much bigger than it is now. Do not confuse this with being a luddite view that streaming and subscriptions are not the future, they are, but there is a long, long journey to that destination that we are only just starting upon for most consumers. And before that there is a far more important issue, namely how to get the remaining CD buyers to go digital. “CD sales decline will likely accelerate. Among the top 10 largest music markets in the world CD revenue decline will likely accelerate markedly in the next few years. In France and the UK leading high street retailers are on their last legs while in Germany and Japan the vast majority (more than 70%) of sales are still physical. So the challenge for digital is can it grow as quickly as the CD in those markets will decline? The IFPI have stressed the fact that Japan’s dramatic 15% decline was the root cause of the global downturn. While this is largely true – without Japan included global revenues still declined 0.1% – Japan’s problems are simply the global industry’s problems squared. In 2012 a staggering 80% of Japanese music sales were physical but despite the digital market actually declining 4 successive years total revenues increased 4%. As the world’s second biggest market, when Japan sneezes the global industry catches a cold. But expect Japan to continue to drag down global revenues and also keep an eye on Germany. Germany saw a modest 1.2% increase in revenues in 2013 but only 22.6% of sales were digital. The most likely scenario is that Germany will follow the Japanese trend and go into a CD-driven dive in 2014 and / or 2015. In conclusion, there is still cause for optimism from these numbers. Subscriptions are going from strength to strength, at least in revenue terms, and the download sector remains robust in buyer number terms. But unless the CD problem is fixed, the best both those digital revenue streams can hope to do is consolidate the market around a small rump of digital buyers. There is no doubt that streaming subscriptions will play a major role in the future of digital music, but their impact is going to be far from immediate. There also needs to be great caution applied to interpreting the encouraging early signs of the advanced streaming markets and the potential impact on total music sales. Norway and Sweden both experienced an upturn in music sales in the first half of 2013 thanks largely to the impact of streaming subscriptions, while most of the rest of the global music market continued in its struggle to return to growth after more than a decade of decline. The easy conclusion to draw is that when streaming subscriptions take hold across the globe, music revenue grow. While there is some truth in the argument, it is too simplistic. 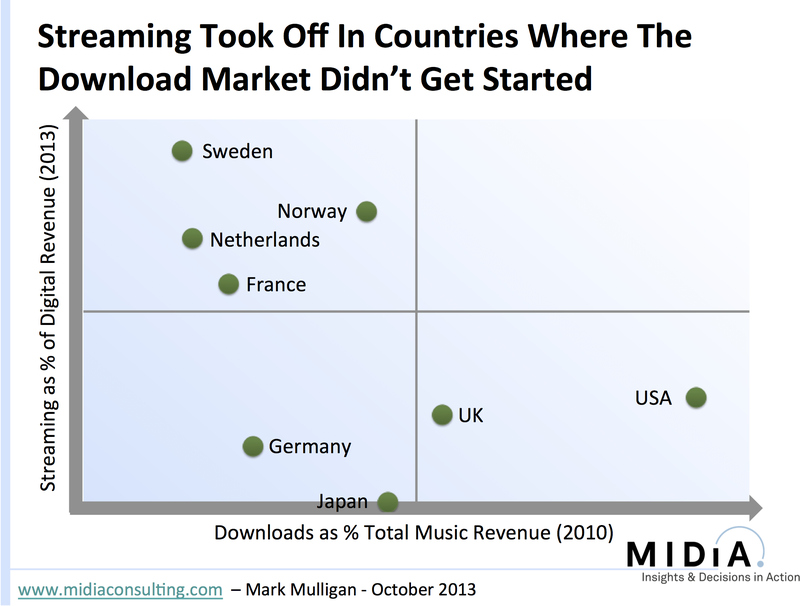 An analysis of the leading streaming markets (Sweden, Norway, France, Netherlands) and the leading download markets (US, UK, Germany, Japan) – see figure one – reveals that streaming took hold in markets where downloads had not. The markets where downloads represented the lowest share of total music sales in 2010 (before streaming really kicked off) are those that in 2013 had the rates of streaming as a share of digital music revenue. In markets where downloads were making the biggest contribution to total music income (not just digital) streaming did not get much of a look in in 2013. In the US and UK streaming subscriptions were in market long before Spotify and Deezer, but most digital music consumers opted for downloads and have been unwilling to switch allegiances since. It will happen over time, but right now downloads have a firm grip and that is largely because of Apple. When we look at the same countries plotted by streaming share against Apple device penetration we see an even more pronounced trend – see figure two. Here the relationship is clear: streaming has taken hold where Apple has not. In short, there was no established mainstream digital music service and streaming subscriptions filled the void. But of greatest significance is the impact on total music revenue. These strong streaming markets contribute just 10% to global digital revenue, even though France and the Netherlands are two of the world’s top 10 music markets. Meanwhile the UK and US alone count for 54%. If you factor in Japan and Germany too you have 71% of all digital music income, and within these four countries (the four biggest music markets) streaming accounted for just 10% of digital revenue. 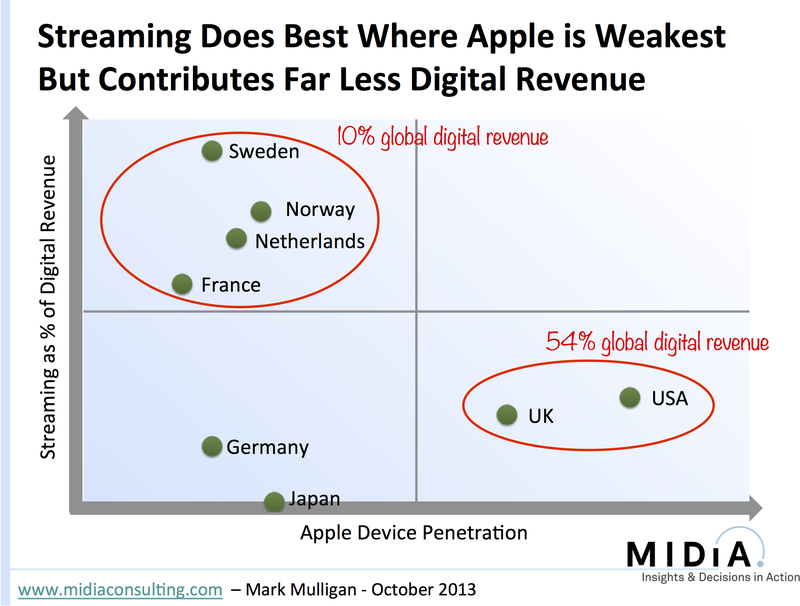 On the other side of the equation, streaming has brought unparalleled growth in its core markets: across Sweden, Norway and the Netherlands digital revenue grew by an average of 213% between 2010 and 2013, compared to an average of just 40% across the big four markets (though Japan’s declining digital sector pulls that average down). And of course the Swedish and Norwegian music markets both grew in 2012 and 2013 while the rest did not. Streaming will grow more slowly in markets where Apple and the download market are strong (which helps explain why growth of Spotify et al appears to have slowed in markets like the US and UK). ‘Home turf’ counts. Most of the big streaming markets have their own local heroes (Sweden – Spotify, Norway – WiMP, France – Deezer) – all of whom also benefited from hard bundles and marketing support from their incumbent telcos. Meanwhile Apple of course prospers on its home turf and that of the English speaking UK. Consumer behavior and technology are all edging towards a more access based world and it is inevitable that the download will become less important. So although these brakes on streaming adoption exist in many markets, they will slow rather than halt the transition. Streaming will near 50% of global digital revenues by 2018. Streaming remains bedeviled by countless issues – not least artist payments – but what is clear is that it has the ability to transform the shape of the digital music market. And while that change may be slower to come than the Swedish and Norwegian experiences might suggest, come it will.